You will need tuna that is absolutely fresh for this recipe, a fusion-inspired dish that is popular in Paris at the moment. Have your fishmonger slice the tuna into steaks no more than 1/2 inch thick, skin removed. Plan to make the dish the same day. As for the black rice, it can be found in gourmet shops or online. I used an Italian variety, and Asian varieties are also available. 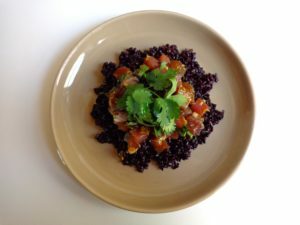 Black rice has a rich, nutty flavor that can’t be beat, and despite the price (high) it is worth making an effort to find some. The tuna needs to be marinated for at least an hour in a sauce of sesame oil, soy and condiments, while a slightly different sauce is stirred into the rice at the last moment. The quantities below will serve two people as a light but very satisfying main dish. Using a very sharp knife, dice the tuna into cubes. Set aside. Combine 2 tsp. sesame oil and 1 tsp. soy sauce in a small bowl. Mince the onion or shallot very finely; add about 1 tsp. of it to the bowl. Finely grate the peel of the lime and add. Finely grate the ginger; add about 1/2 tsp. of it. Add the tuna to the marinade, stir well and refrigerate for an hour or more. About an hour before you plan to serve the dish, cook the rice. You can do this according to the instructions on the packet, or — if there are no instructions on the packet, as was the case with the rice I bought — bring the rice and water to a boil, add a little salt, turn down the heat and simmer, covered, for 30-40 minutes, or until all the water is absorbed. When the rice is ready, let it cool for a few minutes. Then add the remaining 1 tsp. sesame oil and 1 tsp. soy to the pot. Cut your lime in half and squeeze in a little juice. Stir well. Chop most of the cilantro, leaving aside a few pretty leaves for garnish. Add the chopped cilantro to the tuna and stir. Now comes the fun part, assembly. Spoon half the rice onto a plate in a mound. Using the back of the spoon, flatten it into a circle. Pile on half of the tuna, and top with the pretty cilantro leaves. Repeat with the other plate. Serve while the rice is still slightly warm. Serves two generously.